During my tour in Iraq, I was allowed three “Rest and Relaxation” (R&R) trips. 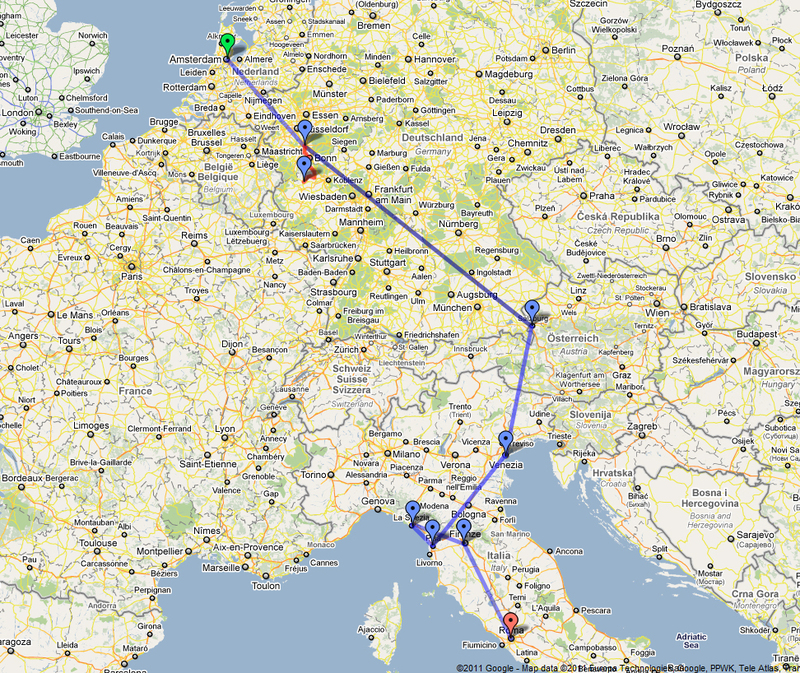 On my final trip, I met up with my brother in Amsterdam, and we worked our way south to Rome. It was an epic trip. The first stop was Amsterdam. We rented some bikes, and worked our way around town. After Amsterdam we took a train to Cologne, then a taxi (I didn’t know there was a bus) to the Nürburgring. If you are a car person, you must visit this epic racetrack at least once in your lifetime. The Ring is a public road, so all rules of the road still apply – you pass on the left, you must use indicators, etc – except that there is no speed limit. It can be thought of as a one-way toll road autobahn with only one on ramp and one off ramp. We rented a Suzuku Swift, heavily modded, and started our laps. After our first day of laps, we watched some others do theirs from a track-side vantage point. Day two meant an even more modified Swift, and another collection of incredible laps. On day three, the track was closed, as a bunch of Porsche enthusiasts had rented the track for the day. Which was fun to watch. From there it was back to Cologne, and then an overnight train to Salzburg, Austria. Truth be told, this was a stop specifically because I wanted to go back to a certain restaurant and get their kartoffelknödel, because it is literally the best in the world. Also, Salzburg is a pretty city, surrounded by beautiful (and history-rich) countryside. Next we hopped a train to Venice. Neither of us had ever been, so we spent a few days here. First thing you notice, the city is a maze. Literally a maze. I’m sure it’s easier to navigate by boat, but we were on foot, attempting to find our hotel, and running in to dead-ends and getting turned around at every corner. Eventually we found our way there, after longer than I’d like to admit, and we unpacked and headed out to see the city. Our next planned stop was the Cinque Terre, but along our route our train stopped in Pisa, so we decided to hop off, and see the leaning tower. Pisa is a small small town, with nothing of note with the exception of the leaning tower. Trains pass through every hour, so we didn’t have to stay for long. Then it was back on the train to the Cinque Terre. We stayed in the southern most town of Riomaggiore. The hostel there was kind of amazing, actually. We were on the side of the hill, and had a large balcony overlooking the water. The room had accommodations for three, but it was only the two of us. The next morning we hiked our way north through the five cities. It’s an incredibly scenic hike, and the food, oh the food. We had to stop in each town and have something to eat. Loads of fresh seafood. This was one of my all time favorite vacations spots. Next up was Florence. A city with some of the most beautiful architecture in the world, and a huge collection of museums to boot. I could have spent more time here, but this was my brothers departure point, so once he was wheels up, I made my way out to Rome. Rome is Rome. This was not my first time to Rome, so I did the tourist circuit, took the mandatory photos, and went to hang out with my friends who were living here. Rome is busy, very busy. And loud. And a bit dirty. The Romans have a reputation which isn’t entirely untrue. If you haven’t been to Rome, spend two days checking off all the tourist boxes here, then get out to the better parts of Italy.